In an ongoing effort to boost its missile defenses, Israel has recently been testing its David’s Sling anti-ballistic missile system. The latest test coincided with positive developments in Iran nuclear talks currently just meters from the finishing line. 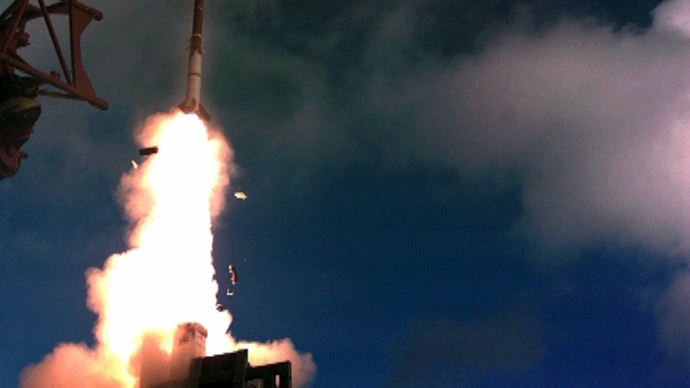 A number of recent David’s Sling missile tests – the most recent one this Tuesday – have been a great success, the Homa Directorate at the Defense Ministry and the American Missile Defense Agency (MDA) announced Wednesday. Also known as the “Magic Wand,” the short-range ballistic missile defense system, designed to intercept medium range missiles from nearby Gaza, Syria, and Lebanon, has been jointly developed the between the Pentagon contractor and by Israel's Rafael Advanced Defense Systems. “The system is designed to intercept… threats from Lebanon. Representatives from the US were present during the trials and are full partners in the project,” Ramti told the Ynet news site. Once fully operational it will be deployed as part of a multi-layered missile defense initiative that already includes the Arrow 1, 2, and 3 systems and the Iron Dome. The system, capable of intercepting incoming projectiles from over 300 kilometers (180 miles) away will also be used to detect, and shoot down drones. But unlike other components of Israel’s missile defense, David's Sling can be deployed both in a mobile and stationary positions. “This system, which will be part of a multi-layered defense system, will in the near future work with existing components to defend Israel against the threat of missiles, and deal more efficiently with threats,” the ministry said. Israel estimates that around 100,000 rockets currently in Hezbollah’s possession would allow the group to launch some 1,500 against Israel daily, according to a scenario formulated by the Home Front Command and the IDF Planning Directorate. While the new system is designed to save lives the cost of deployment remains quite high. It has previously been estimated that one interception using the David's Sling system costs Israel $1 million. Last month, Israeli officials asked Washington for $317 million in additional funding for Israeli missile defense programs, including the development of David's. That is an addition to $158 million in funding already asked by the White House in its fiscal 2016 budget. Last week a group of 32 senators urged Congress to fully meet Israel's missile defense funding request. The announcement of the latest tests, coincided with the visit of John Boehner, speaker of the US House of Representatives, to Israel. It also coincides with the timing of tense international negotiations on Iran’s nuclear issue, as the talks are extended for another day. Israel which sees Iran’s peaceful nuclear program as covert means for Tehran to obtain nuclear weapons, have persistently urged the international community and P5 +1 not to strike a deal with Tehran. Israeli Prime Minister Benjamin Netanyahu, said on Wednesday it was time for the international community to stand its ground and insist on a better deal than is currently being finalized. “A better deal would significantly roll back Iran's nuclear infrastructure. A better deal would link the eventual lifting of the restrictions on Iran's nuclear program to a change in Iran's behavior,” he said.